It takes just a few seconds to choose a cookie over an apple and wreck your diet for the day. But what is happening during those few seconds while you make the decision? In a new study, researchers watched in real time as people’s hands revealed the struggle they were under to choose the long-term goal over short-term temptation. The work, forthcoming in Psychological Science, a journal of the Association for Psychological Science, represents a new approach to studying self-control. In one key experiment, participants viewed pictures of a healthy and an unhealthy food choice on opposite sides of the top of a computer screen and moved a cursor from the center bottom to select one of the foods. 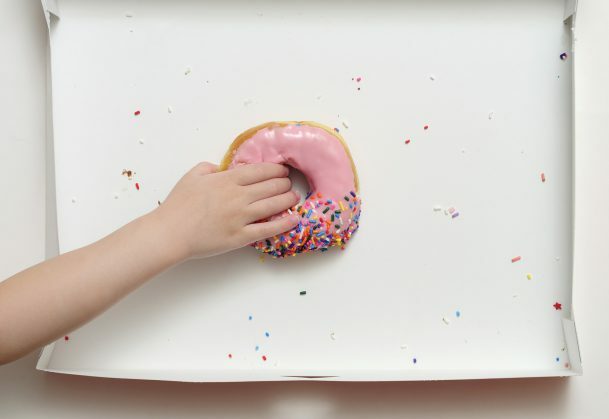 People who moved the cursor closer to the unhealthy treat (even when they ultimately made the healthy choice) later showed less self-control than did those who made a more direct path to the healthy snack. “Our hand movements reveal the process of exercising self-control,” said Paul Stillman, co-author of the study and postdoctoral researcher in psychology at The Ohio State University. The results may shed light on a scholarly debate about what’s happening in the brain when humans harness willpower. Stillman conducted the study with Melissa Ferguson, professor of psychology, and Danila Medvedev, a former undergraduate student, both from Cornell University. The study involved several experiments. In one, 81 college students made 100 decisions involving healthy versus unhealthy food choices. In each trial, they clicked a “Start” button at the bottom of the screen. As soon as they did, two images appeared in the upper-left and upper-right corners of the screen, one a healthy food (such as Brussels sprouts) and the other an unhealthy one (such as a brownie). They were told to choose as quickly as possible which of the two foods would most help them meet their health and fitness goals. So there was a “correct” answer, even if they were tempted by a less healthy treat. Before the experiment began, the participants were told that after they finished they would be given one of the foods they chose in the experiment. At the end, however, they could freely choose whether they wanted an apple or a candy bar. The results showed that those who chose the candy bar at the end of the experiment – those with lower self-control – had tended to veer closer to the unhealthy foods on the screen. “The more they were pulled toward the temptation on the computer screen, the more they actually chose the temptations and failed at self-control,” Stillman said. But for those with higher levels of self-control, the path to the healthy food was more direct, indicating that they experienced less conflict. In two other studies, similar results occurred in a completely different scenario, in which college students could decide whether they would rather accept $25 today or $45 in 180 days. Those with lower levels of self-control had mouse trajectories that were clearly different from those with higher self-control, suggesting differences in how they were dealing with the decisions. “This mouse-tracking metric could be a powerful new tool to investigate real-time conflict when people have to make decisions related to self-control,” he said. The findings also offer new evidence in a debate about how decision-making in self-control situations unfolds, Stillman said. When the researchers mapped the trajectories people took with the cursor in the first experiment, they observed that most participants did not automatically start directly toward the unhealthy treat before abruptly switching course back to the healthy food. Rather, the trajectories appear curved, as if both the temptation and goal were competing from the beginning. Some researchers have argued that there are two systems in our brain that are involved in a self-control decision: one that’s impulsive and a second that overcomes the impulses to exert willpower. But if that were the case, the trajectories seen in this study should look different than they do, Stillman said. If dual systems underlie these choices, there should be a relatively straight line toward the unhealthy food while people are under the influence of the impulsive first system and then an abrupt change in direction toward the healthy food as the system in charge of self-control kicks in. Stillman said these results should help lead to a more accurate view of how our cognitive processes unfold to allow us to resist temptation. All data and materials have been made publicly available via the Open Science Framework. The complete Open Practices Disclosure for this article is also online. This article has received badges for Open Data and Open Materials.